The feature engineering process involves selecting the minimum required features to produce a valid model because the more features a model contains, the more complex it is (and the more sparse the data), therefore the more sensitive the model is to errors due to variance. A common approach to eliminating features is to describe their relative importance to a model, then eliminate weak features or combinations of features and re-evalute to see if the model fairs better during cross-validation. The above figure shows the features ranked according to the explained variance each feature contributes to the model. In this case the features are plotted against their relative importance, that is the percent importance of the most important feature. The visualizer also contains features_ and feature_importances_ attributes to get the ranked numeric values. The interpretation of the importance of coeficients depends on the model; see the discussion below for more details. Generalized linear models compute a predicted independent variable via the linear combination of an array of coefficients with an array of dependent variables. GLMs are fit by modifying the coefficients so as to minimize error and regularization techniques specify how the model modifies coefficients in relation to each other. As a result, an opportunity presents itself: larger coefficients are necessarily “more informative” because they contribute a greater weight to the final prediction in most cases. We can compare models based on ranking of coefficients, such that a higher coefficient is “more informative”. We can compare instances based on ranking of feature/coefficient products such that a higher product is “more informative”. In both cases, because the coefficient may be negative (indicating a strong negative correlation) we must rank features by the absolute values of their coefficients. Visualizing a model or multiple models by most informative feature is usually done via bar chart where the y-axis is the feature names and the x-axis is numeric value of the coefficient such that the x-axis has both a positive and negative quadrant. The bigger the size of the bar, the more informative that feature is. This method may also be used for instances; but generally there are very many instances relative to the number models being compared. Instead a heatmap grid is a better choice to inspect the influence of features on individual instances. Here the grid is constructed such that the x-axis represents individual features, and the y-axis represents individual instances. The color of each cell (an instance, feature pair) represents the magnitude of the product of the instance value with the feature’s coefficient for a single model. Visual inspection of this diagnostic may reveal a set of instances for which one feature is more predictive than another; or other types of regions of information in the model itself. Implementation of a feature importances visualizer. This visualizer sits in kind of a weird place since it is technically a model scoring visualizer, but is generally used for feature engineering. Displays the most informative features in a model by showing a bar chart of features ranked by their importances. Although primarily a feature engineering mechanism, this visualizer requires a model that has either a coef_ or feature_importances_ parameter after fit. Note: Some classification models such as LogisticRegression, return coef_ as a multidimensional array of shape (n_classes, n_features). In this case, the FeatureImportances visualizer computes the mean of the coefs_ by class for each feature. A Scikit-Learn estimator that learns feature importances. Must support either coef_ or feature_importances_ parameters. 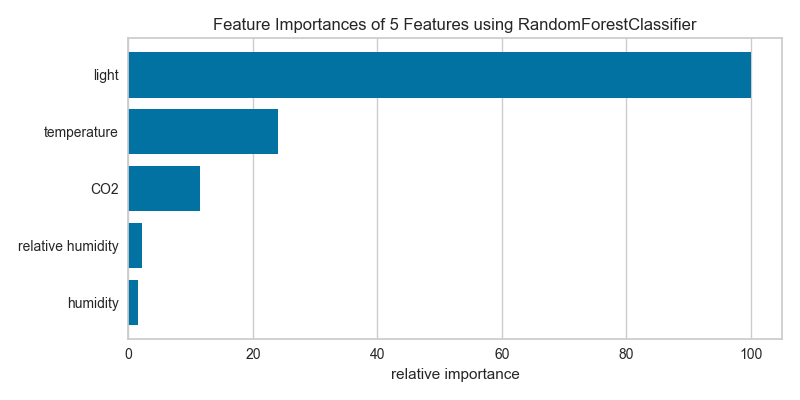 If true, the features are described by their relative importance as a percentage of the strongest feature component; otherwise the raw numeric description of the feature importance is shown. Make all coeficients absolute to more easily compare negative coeficients with positive ones. The label for the X-axis. If None is automatically determined by the underlying model and options provided. If true and the classifier returns multi-class feature importance, then a stacked bar plot is plotted; otherwise the mean of the feature importance across classes are plotted. The classees labeled. Is not None only for classifier. Draws the feature importances as a bar chart; called from fit. Fits the estimator to discover the feature importances described by the data, then draws those importances as a bar plot.